Gondola Getaway was truly innovative when it began in 1982. Since then tens of thousands of passengers have been ferried in authentic Venetian gondolas through the canals of Naples Island. Singing gondoliers navigate the narrow waterways as guests enjoy views of multi-million dollar homes and picturesque arched bridges gliding past L'Accademia to the Ravenna, onward to The Toledo, hugging Neapolitan East and, finally, under the Treasure Island Bridge. 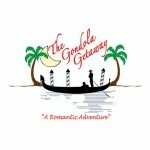 No passport needed - simply bring a bottle of wine and let Gondola Getaway do the rest. This is where you can Ciao and Chow.